in Ventura County — the second in the country. SLIDESHOW ABOVE: Ojai is an idyllic community, blessed with equal parts small-town charm, sun dappled parks, panoramic mountains, and now … some of the quietest and least polluting grounds maintenance in the country. 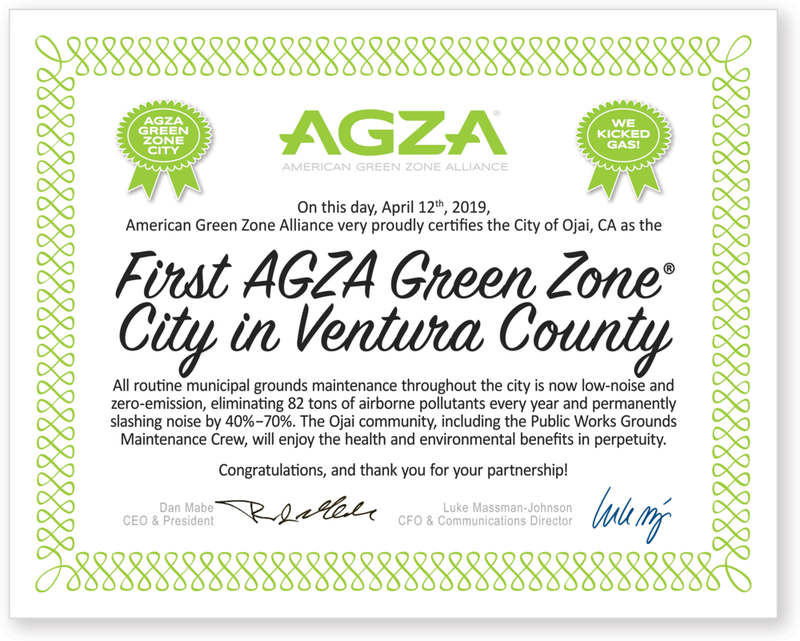 The City of Ojai is the first AGZA Green Zone® City in Ventura County, and the second city-wide AGZA Green Zone in the United States. The City and American Green Zone Alliance (AGZA) will formally certify the sustainability achievement at a public ceremony in Libbey Park, Friday April 12th at 11am. AGZA Green Zone City Certification establishes and verifies that all routine grounds maintenance on municipal properties — mowing, hedging, edging, trimming, sawing, and blowing — are serviced exclusively with low-noise zero-emission battery-electric equipment and manual hand tools. 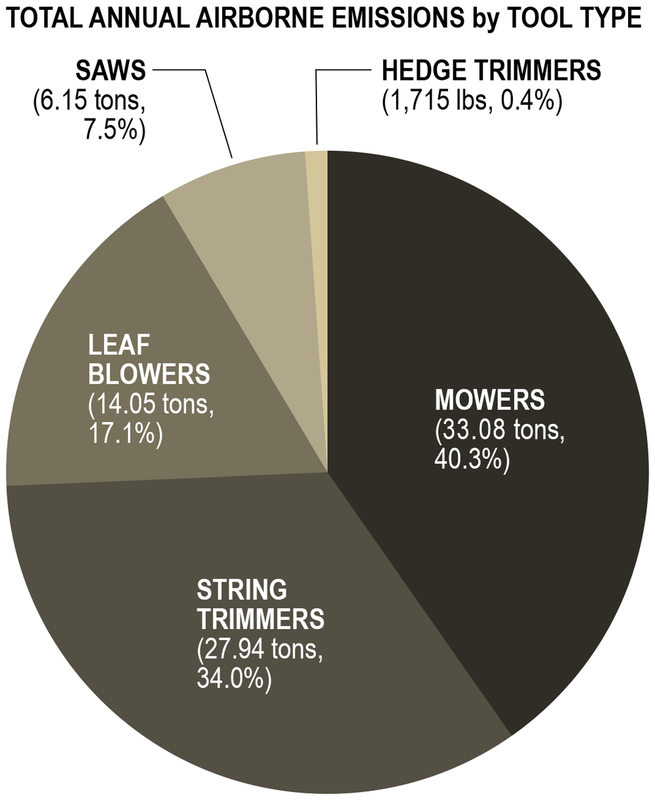 AGZA Green Zones are the most rigorous sustainability criteria for eliminating the health and environmental impacts of the lawn & garden industry. Ojai’s city-wide AGZA Green Zone protects 52 acres across 19 municipal properties, including all parks and sports fields and city hall. This milestone caps a year of collaboration between the City and AGZA. For the previous two decades the community of Ojai had been wrestling a contentious leaf blower debate with no end in sight. Mayor Johnny Johnston sought a permanent solution — one which would reduce noise and pollution and still allow municipal lawn crews the commercial-grade equipment they required to perform their jobs. Ojai city leadership supported an exploration into alternative sustainable operations, and Public Works Grounds Maintenance Manager Miguel Contreras began researching commercially capable electric equipment. But the path to safe, successful, fiscally responsible electric operations was far from clear, so Ojai sought expert guidance and proven methods. Ojai resident and pro-bono strategist Dr. Steven Colomé, and former California Air Resources Board (CARB) Monitoring and Laboratory Division Chief, Michael Benjamin, both pointed Mayor Johnston to the example of South Pasadena, the nation’s first AGZA Green Zone City. The award-winning AGZA sustainably model successfully implements low-noise zero-emission maintenance of all city parks, sports fields, city hall, library, museums, memorials, paths and medians, and the city golf course. MAP ABOVE: Routine maintenance of all of Ojai’s municipally maintained properties — from parks and sports fields to city hall and bike paths — are now performed exclusively with low-noise zero-emissions battery electric equipment and hand tools. Ojai leadership retained AGZA to apply AGZA Green Zone Certification across all of Ojai city properties. The next hurdle was capital investment. AGZA determined a commercial-grade battery-electric fleet that could replace all of Ojai’s existing routine gas operations would be $60,000, about twice the cost of a comparable gas fleet. However, AGZA also demonstrated that total annual operational costs of the electric fleet would be far less than for the existing gas machines, with a very healthy three-year ROI and substantial ongoing financial savings thereafter. Still, the City needed support to procure the electric fleet. Ojai found a financial bridge in a $60,000 grant from the Ventura County Air Pollution Control District. Approval and support of VCAPCD leadership, including APCO Mike Villegas, Air Quality Engineer Stan Cowen, and Clean Air Advisory Fund chair Mike Stubblefield, were essential for the City’s equipment investment. SLIDESHOW ABOVE: AGZA hosted three hands-on electric equipment demonstrations for City of Ojai officials and grounds crew. The final step will be the AGZA Green Zone City Certification ceremony on April 12th. AGZA ran Ojai’s entire gas fleet through our proprietary Gas Emissions Calculator. Engine stroke, displacement, horsepower, valve position, and production year were logged, researched, and tracked across nationally verified emissions tables of EPA Class and Phase compliance. The resulting emissions factors were then multiplied by run-time per week, per season, and per year to reveal annual output of HC, CO, NOx, PM and CO2 into the community. A subset of our proprietary process is shown below. Methodology and formulas are hidden. Final results are highlighted in yellow. What do all those numbers mean? Every year the AGZA Green Zone will prevent the creation of over 82 tons of CO2, CO, HC, PM2.5, and NOx from the city. Noise has been permanently reduced by 40% to 70%. Fuel spillage, evaporative emissions and solid waste from gas maintenance have been completely eliminated. Significant reductions in hourly operational costs, replacement parts, and maintenance will achieve a healthy ROI on the new electric fleet. The health, environmental, and financial benefits will compound every year. 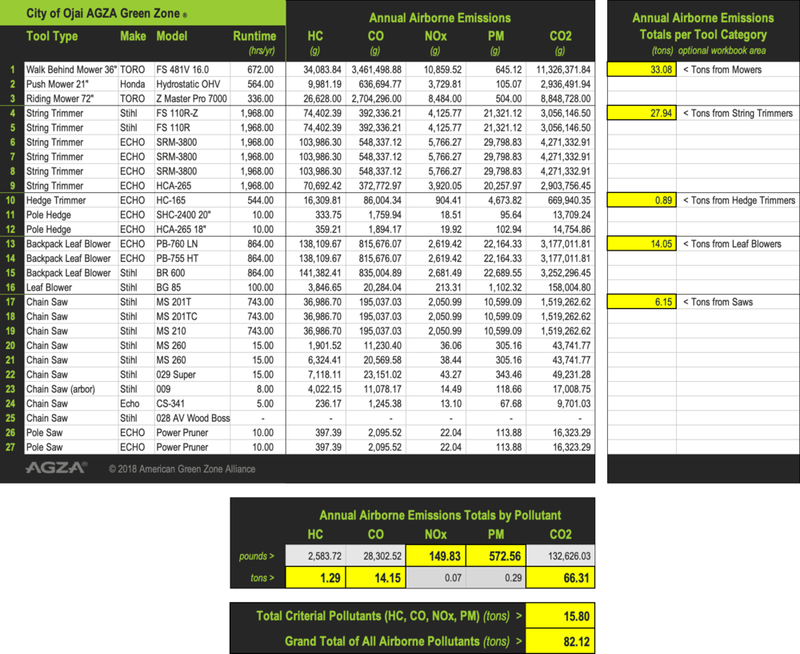 The raw data from the emissions calculations has value all by itself, but they also let us analyze two useful questions regarding gas operations: “What were the most significant airborne emissions from Ojai’s gas operations?”, and, “Which categories of Ojai’s gas tools emitted the most pollution?” The two charts below answer those questions. SLIDESHOW ABOVE: Once the City procured their electric fleet, AGZA helped them strategize a safe, secure charging and storage facility. The City of Ojai staff followed through on all of the AGZA recommendations of setting up a safe, organized, temperature-controlled, tamper-free storage area for their new electric fleet. Ojai City staff dedicated an adequate storage space within existing structures at the DPW maintenance yard. City engineers upgraded the power line to the storage facility and installed a new panel with multiple breakers to dedicated charging outlets. They insured the entire system was rated to safely handle ten battery chargers simultaneously, for optimal daytime and overnight charging. Ojai City staff also installed a ventilation fan to maintain ideal room temperatures and reduce extreme heat conditions in the peak summer months. The powered fan draws cool outside air from the tree-shaded side of the building and pushes it directly onto the charging bench to ensure maximum indoor temperatures don’t exceed the recommended ratings of the chargers and batteries. Additionally, a full-enclosure cage with a coded security lock and security camera were installed to protect the fleet investment. AGZA recognizes Ojai City staff's attention to organization, safety, and security. This charging and storage setup will serve as a role model and new standard for AGZA Certifications in the future. The primary concern for Ojai’s battery charging bench was overheating. The machine shed where the batteries are charged could reportedly reach over 140˚F in summer. The bank of batteries the City procured, STIHL’s AP300 handheld and AR3000 battery backpacks, recommend a wide operating range of 14˚F — 122˚F. Interestingly, the STIHL AL500 chargers recommend a tighter charging temperature range of 41˚F — 104˚F. The primary risk of overheating in any lithium battery is heat expansion, case cracking, thermal runaway, short circuiting, and possible fire. STIHL’s lithium battery chemistry, industrial design, passive thermal protection, and active on-board battery management systems are of the highest quality and specifically intended to minimize the risk of overheating. AGZA can attest to the durability and reliability of STIHL batteries: in a decade of using STIHL tools in commercial settings, even in the heat of SoCal, we have not heard of a single STIHL battery overheating into a fire. But of course fire safety is of the utmost importance — especially to a rural community flanked by tinder-dry forests and brush-covered mountains, and which experienced encircling wildfires just the previous year. So the goal was to keep ambient temperatures of the charging station well below the safe 122˚F battery threshold, and ideally below the recommended 104˚F charging threshold. AGZA and the Ojai crew discussed options: passive ceiling ventilation, powered fan ventilation, and/or rigging heat-reflective tarping over the entire machine shed. A small passive ceiling vent already existed directly over the charging bench. It was clear this had not been sufficient. The crew repurposed a large unused ventilation fan and installed it with ducts that drew air from the coolest tree-shaded side of the shed, blowing directly down on the charging bench. To track temperatures on the charging bench, Steve Colomé loaned a Lascar Electronics EL-USB-2-LCD RH/TEMP data logger which was set among the STIHL chargers. Hourly temperatures were captured from July 2018 through February 2019. Over the 207-day study, charging temperatures rarely exceeded the ideal charging range, and when they did it was for a very short time and by only a few degrees. Temperatures exceeded 104˚F for only 16 cumulative hours across 5 days in August and September. This represents just 0.32% of the total time measured, during which temperatures exceeded 104˚F by an average of just 2.6˚F. 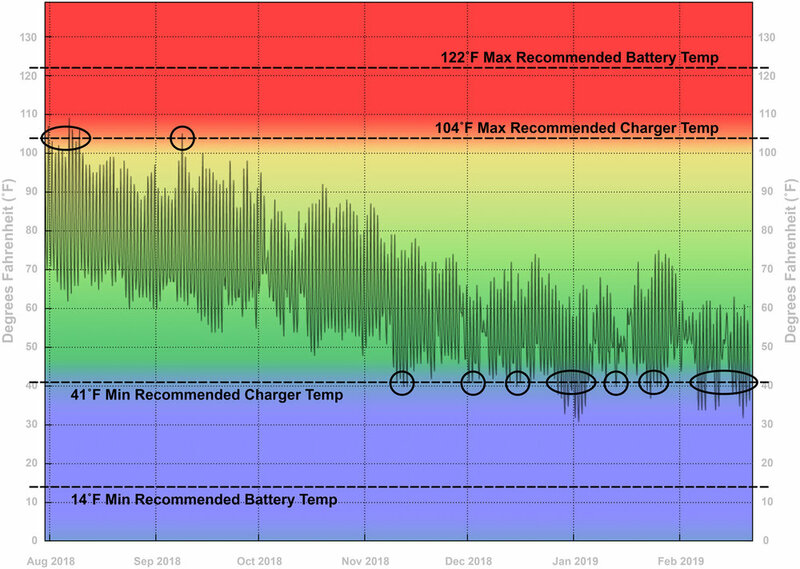 The highest ambient temperature on the charging bench was 109˚F — a comfortable margin from the maximum recommended battery temperature of 122˚F. Given the significant concern of an overheated charging shed, the installation of the reclaimed fan proved to be an incredibly cost-effective and successful effort. With the focus on extreme heat, less attention was given to the possibility and effect of very low temperatures in the charging shed. Cold temperatures don’t pose a serious risk to batteries the way extreme high temps can, but they do have the potential to slow battery charge times and shorten run times. The data reveal there were far more days in which the chargers were exposed to lows below the suggested minimum temp than to highs above the maximum. Over the 207-day study, temperatures dropped below range for 202 cumulative hours on 28 various days from November through February. This represents 4.07% of the total time measured, during which temps dropped below 41˚F by an average of 4.79˚F. The lowest ambient temperature in the shed was 31˚F — a comfortable margin from the minimum recommended battery temperature of 14˚F. The Ojai crew did not report any compromises to charging rates or battery run times during the coldest days of winter. Perhaps it’s just a happy coincidence that the slowest growth rates and least challenging work production requirements during winter align perfectly with whatever potential limits to charging and batteries the coldest temperatures may have caused. In any event, Ojai’s charging setup has proven to be safe and effective. SLIDESHOW ABOVE: AGZA has developed a groundbreaking portfolio of educational, strategic, and analytical support materials. The City of Ojai can be very proud to have eliminated the vast majority of health and environmental impacts from their land care forever. The direct and indirect benefits to all of Ojai’s community will be appreciated over time. Families, schools, and businesses will enjoy quieter, healthier, more peaceful public spaces. Maintenance of City parks and properties will no longer contribute to local smog or climate change. The City’s grounds crew won’t be exposed to hazardous noise levels, toxic fuel, carcinogenic fumes, or hand-numbing vibrations. Spent air and oil filters, spark plugs, and cans of solvents will no longer pollute the landfill. Local water and soil will no longer absorb fuel and oil spills. 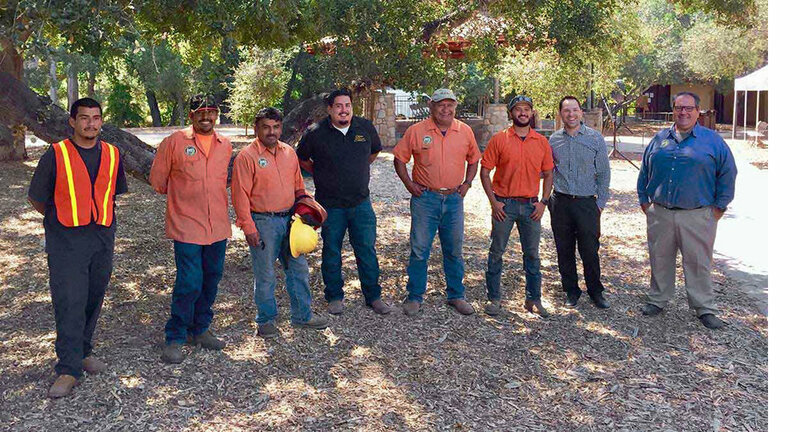 PHOTO ABOVE: Ojai’s Public Works Grounds Maintenance crew are the latest certified AGZA Service Pros. Congratulations!